"Ranulf de Briquessart or Ranulf the Viscount (died c. 1089 or soon after) was an 11th century Norman magnate and viscount. Ranulf's family were connected to the House of Normandy by marriage, and, besides Odo, bishop of Bayeux, was the most powerful magnate in the Bessin region. He married Margaret, daughter of Richard Goz, viscount of the Avranchin, whose son and successor Hugh d'Avranches became Earl of Chester in England c. 1070." It sounds as though Ranulf de Briquessart (= a Bessin location) was himself tied back (rather than forward only) to the Rollo Normans by marriage, but the piece does not explain how so. We see that Ranulf le Meschin was a Goz on his mother's side, but we are not given any other information to reveal what peoples these father-and-son Ranulfs were from aside from Marriage to the Normans. The point is, I had traced the Rollo bloodline to the same Hebrew-Khazar Moravians that the Meschins have been traced to, and it was BEFORE the Meschin trace. If the Ranulfs do link to Clares, therefore, the Rollo Clares may have arrived to the West in the first place as the proto-Meschins of the Bessin. Understand that Templarism traces to the Khazar Moravians (my personal idea), and that the Rollo bloodline is considered sacred (by others) in Templarism/Freemasonry. Never did I suspect that Meschins would play high-level roles in those historical scripts. But I did start to suspect (years ago) that God was using me, in particular, to reveal the Dragon cult because my own Masci bloodline would egg me on toward Meschin revelations not yet discovered and/or made public. And here I am to my own amazement. There's obvious importance in tracing the Goz family, and I want to get to it. FE has already found some links of the Goz surname, and emailed them to me, but I do not want to share it here until I feel the time is right. Today, I would like to discuss Ranulf's kingdom, looking for whatever clues may come up. I know that an historian would think it crazy for me to claim that the Rollo line came from Moravians, let alone that they ruled at Moray, but with the Ranulf trace to the Randolphs of Moray, suddenly I begin to have evidence that it's all true, especially when it's shown, as it is in the quote above, that the Ranulfs were closely tied to the Rollo Normans. "Ranulf of (Briquessart) is probably the 'Ranulf the viscount' who witnessed a charter of William, Duke of Normandy, at Caen on 17 June 1066. Ranulf helped preside over a judgement in the curia of King William (as duke) in 1076...On 14 July 1080 he witnessed a charter to the Abbey of Lessay...another in the same year addressed to Remigius de Fécamp bishop of Lincoln...and one more in the same period...His name is attached to a memorandum in 1085, and on 24 April 1089 he witnessed a confirmation of Robert Curthose, Duke of Normandy and Count of Maine to St Mary of Bayeaux, where he appears below his son in the witness list. Richard and William are names of the Rollo line, and the Ranulf's held important positions in William the Conqueror's domains. Here's more clues but without particulars:"Ranulf le Meschin's father and mother represented two different families of viscounts in Normandy, and both of them were strongly tied to Henry, third son of William the Conqueror. His father was Ranulf de Briquessart, and likely for this reason the former Ranulf was styled le Meschin, 'the younger'. There is something being hidden from us, for shortly after I revealed (in the chapter above) that the triple red chevron on gold, the Clare symbol, was the very same symbol of the Dutch Burgh/Burger Coat on account of the important marriage above, the Dutch Burgh Coat changed at houseofnames.com to red stars on gold. I am not mistaken, for I was married to a Dutch woman with the Burger maiden name, and I showed my own children that this surname used the red triple chevron on gold. I haven't yet pinned down whether the red triple chevron on gold was passed by the Clares to the Burghs, or vice-versa. In the Crisp'n Claro Picture, I was after the origins of the red triple chevron on white, and below I will show you one that I found last night as a result of the this Meschin investigation. Note that the Irish Burgh Coat is also red on gold, and that the write-up traces to Clares of the Welsh-English border: "First found in county Galway, where they had been granted lands by Strongbow, the Earl of Pembroke, for their assistance in the invasion of Ireland in 1172." More funny. Either the statement beneath Wikipedia's Arms of Ranulf le Meschin was not there when I had viewed it, or I neglected to read it. It claims that the colors of his lion are not known, yet there must be a reason as to why the article displays it as a red-on-gold lion. The son of Ranulf le Meschin was styled, Ranulf de Gernon, while Gernon Coat shows two gold lions on red, the symbol of Normandy. The lions are on a red and blue shield-on-shield design, the two main Polish colors and a Polish/Sobieski/Janina design. "Odo of Bayeux (c. 1036 - February 1097, Palermo), Norman bishop and English earl, was the half-brother of William the Conqueror, and was for a time second only to the king in power in England. He was the son of William the Conqueror's mother Herleva, and Herluin de Conteville. Count Robert of Mortain was his younger brother." Odo was a Burgh too! But hardly no one online reveals that the Contevilles were Burghs, from John de Burgh (is that a Janina bloodline?). Why are Contevilles not revealed as Burghs? Who were the Burghs besides those who ruled half of the Conqueror's domains??? I note that the German Burghs use white stars on blue, the Moray symbol, and the symbol that I trace from duke BEZprym to the Bes/Bez surname of France. "...'Mitchell' appears as a feasible variation of 'Mascil/Mascall,' or the Meschin variation, Mascelin, or even 'Maxwell.' This should explain why the Scottish Mitchell Coat well-reflects the Meschin Coat, but now see that the Mitchell Coat uses three gold mascles (!) instead of Meschin's three gold scallops [the English Mitchells use scallops]. ...the Mitchell motto includes the phrase, 'Dio supero.' I was just talking yesterday on the Sobieski variations of Zober and Zoberer (there is also a Soberg one). It was just yesterday that I was tracing these terms solidly to the Basque region of Zuberoa. This morning, at the sight of 'supero,' I tried a for a Super Coat and got the Soper/Souper/Super surname of England. I was amazed, because when I wrote above that Mitchells might be linked to Maxwells, I knew without looking that Maxwells use a black saltire on white, and was hoping to find one in the Mitchell family. The Soper/Super symbol is a black saltire on white! The latter find, that a Mitch surname was registered under the Muschat family (that includes a "Montfichett" variation) clinched the Mitchell link to the Meschins, but when I re-checked the Mitch/Muschat/Montfichett surname last night, I saw a triple red chevron on white!! The fact that the Gernon surname from Ranulf le Meschin's son was first found in Montfitchet could link the Burgh triple chevron to the Muschat/Montfithett triple chevron. The question is then whether the latter links to the same triple chevron (with colors reversed) of king Ieston's Morgannwg, and the possibility seems high since the Clares carried the triple chevron to Wales. "...Ranulf le Meschin's great-grandmother may even have been from the ducal family of Normandy, as le Meschin's paternal great-grandfather viscount Anschitil is known to have married a daughter of Duke Richard III. Ranulf le Meschin's mother was the daughter of Richard Goz. Richard's father Thurstan Goz had become viscount of the Hiémois between 1017 and 1025, while Richard himself became viscount of the Avranchin in either 1055 or 1056. Her brother (Richard Goz's father) was Hugh d'Avranches "Lupus" ("the Wolf"), viscount of the Avranchin and Earl of Chester (from c. 1070). Ranulf was thus, in addition to being heir to the Bessin, the nephew of one of Norman England's most powerful and prestigious families. ...Between 1098 and 1101 (probably in 1098) Ranulf became a major English landowner in his own right when he became the third husband of Lucy, heiress of the honour of Bolingbroke in Lincolnshire. This acquisition also brought him the lordship of Appleby in Westmorland, previously held by Lucy's second husband Ivo Taillebois." That looks like the Talbot surname. We saw the Arms of Port Talbot (Wales) late in the last update (scroll down the page). It uses clarions between the Morgannwg triple chevron. There we see Ranulf's domains in Lincolnshire, especially in Bolingbroke, which term could link to the Boleslaw kings. See the Bolingbroke Crest using three white ostrich feathers (out of a chapeau hat), reflective of the white feathers in the Irish Clare Crest. The Crest of the Arms of Port Talbot use ostrich feathers growing out of a clarion. The Talbots were first in Shropshire, by the way, and use a red lion on white, the Rhodes-lion color. It could just be that the Rhodes Coat uses red and gold, and even the red lion of Ranulf le Meschin, as per the latter's domains in Lincolnshire (where the Rhodes family was first found). The article continues: "Marriage to a great heiress came only with royal patronage, which in turn meant that Ranulf had to be respected and trusted by the king. Ranulf was probably, like his father, among the earliest and most loyal of Henry's followers, and was noted as such by Orderic Vitalis...A letter to the men of Lincolnshire names Ranulf as one of four figures entrusted with collecting these oaths...Ivo Taillebois, when he married Ranulf's future wife Lucy, had acquired her Lincolnshire lands..."
"A charter issued in 1124 by David I, King of the Scots, to Robert I de Brus cited Ranulf's lordship of Carlisle and Cumberland as a model for Robert's new lordship in Annandale. This is significant because Robert is known from other sources to have acted with semi-regal authority in this region. A source from 1212 attests that the jurors of Cumberland remembered Ranulf as quondam dominus Cumberland ('sometime Lord of Cumberland')." We then find that Ranulf was pro-Catholic, "founding a Benedictine monastic house at Wetheral...established as a daughter-house of St Mary's Abbey, York, a house that in turn had been generously endowed by Ivo Taillebois." In the last update, the Forez/Foret motto, "travers," led to the discovery that the Travers Coat uses scallops in the Meschin colors. Now read on in the Meschin history: "...As an incoming regional magnate Ranulf would be expected to distribute land to his own followers, and indeed the record of the jurors of Cumberland dating to 1212 claimed that Ranulf created two baronies in the region. Ranulf's brother-in-law Robert de Trevers..." I wrote: "PLUS, the Travers Crest is a spotted leopard or tiger," symbol of the Rhodes Crest. But, more particularly, the Travers leopard was being linked to the Coper/cooper surname, wherefore read on: "[Ranulf] appears to have attempted to give the large compact barony of Gilsland to his brother William, but failed to dislogdge the native lord, the eponymous 'Gille' son of Boite; later the lordship of Allerdale (including Copeland)..." See the Copeland Coat too, with Washington design and Merry/Mary red square. As per the escallop symbols of the Meschins, the article mentions the Esk river of Eskdale, Cumbria, though there is another Esk river in Yorkshire. Finally, Ranulf died in January 1129, and was buried in Chester Abbey. He was survived by his wife and countess, Lucy, and succeeded by his son Ranulf de Gernon. A daughter, Alicia, married Richard de Clare, a lord in the Anglo-Welsh marches." There you have prime evidence of a Clare link. I would venture to suggest that the Clares were from the Burgh/Contvilles, as were the Meschins, and that they came into Arthurian bloodlines when they arrived to Britain. Knowing now that "Clare" derives from "Claver," see that both Clavers and German Burgers use what I call the Moreno castle. I'll re-mention that the Moreno surname has a Muratin variation that I've linked to similar British surnames such a Murton. I've seen that "Morton" has a Moreton variation, and today I find that Robert of Mortain was the younger brother of Herluin de Conteville!! This made me try for a Herl surname, and one came up using ducklings, reflective of the Gas/Gascon duckling (evoking the Goz bloodline of the Meschins). The Herl ducks are called "shovelers," and that led to the Shovel(ler) Coat. I have always suspected that the Gascon duck, a sheldon species I think, was meant as a gosling, as that code reflects the Gascones...and of course "Goz." Therefore, the goose	(see verification) in the French Gas/Garc Coat. Finally, although I cannot recall the spelling of the surname that FE found to be from the Goz family, I recalled it being Giri-like. When I entered "Giri" this morning, up popped red lions on gold of the Gille family, suggesting that the red lion on gold shown at Wikipedia's article on Ranulf ler Meschin could be correct. IN FACT, a red lion on gold is in the Gernon Chief. Recall the quote above: "[Ranulf] appears to have attempted to give the large compact barony of Gilsland to his brother William, but failed to dislogdge the native lord, the eponymous 'Gille' son of Boite..." As the holy-grail cult is trace-able to HohenStaufens, see the Hohen Shield acting as the Scottish Gilsland Coat, and the gold cup in the Crest. The French Gille surname is a said to be from the Norman vikings; it was this surname, says the write-up, that was linked to Gilsland. FE, if you are reading this, I think it's time to revisit your email on the Giri-like surname. Do you recall all the things you shared? I hope I can dig out that aging email. I have no time to get to the news today, and may not have updates much at all in coming days. God bless you all. Some readers may think it's crazy to believe that men can cause earthquakes. Until now, I not only disbelieved that Tesla-related methods could induce quakes, but I hadn't seen evidence. Opening an email from Bernie last night, I found myself viewing a chart with signals recorded by the HAARP Induction Magnetometer in Gakona, Alaska. If one clicks the "Next Day" and "Previous Day" buttons, it can be readily seen that the signals started on January 10th, about midday, and continued strong through the 11th and into half of the 12th. After about noon on the 12th, the signals subside and come to a complete end within hours, as if the quake-triggering machine was shut off at about noon, as soon as significant quake rumblings were picked up by seismometers, but had to wind down until 2 pm before ceasing to emit its high-watt electric energy into the rocks below Haiti. I understand that, very non-coincidence like, the center of the quake was directly below the Haitian capital. If not mistaken, the HAARP signals at Gakona (south-east corner of Alaska) are provided by the Japanese (i.e. totally unrelated to those who might create quakes), and measure radiation in the sky's magnetic field. The point is, noon in Gakona is either 4 or 5 pm in Haiti. The quake occurred at 4:53 pm Haiti time!! This is very conspicuous, especially as my sense has been that the Haitian catastrophe has been intended as a U.S/globalist "invasion." Of course, that idea is so "nutty" that hardly anyone would admit to taking it on. The electric machines said to create quakes do not have anywhere near enough energy caused by quakes. If not mistaken, the electric energy is used merely to cause rocks to slip so as to trigger a quake. As you may know, there were mysterious rainbow-colored clouds caught on video (available online) some 300 miles from the epicenter of the last large China quake; these clouds were seen by many, hours before the quake but maintaining up to the very last minutes before the quake. In order to create colored clouds, water molecules in the clouds need to be excited by electromagnetic energy. This suggests that the quake-making lunatics cannot keep evidence hidden for their acts. God help them if they created the Haitian disaster, and may they have the darkest places in hell if done with complete deliberation to kill much of the population. Italy's top disaster expert, Guido Bertolaso: "[the U.s. reaction to the Haiti quake was/is] a pathetic situation which could have been much better organized."" "Bertolaso, who arrived in Haiti on Friday, told RAI state television that Washington had made 'a show of force,' but military officers coordinating the emergency had no links with the humanitarian groups in the Caribbean island state. 'We are missing a leader, a coordination capacity that goes beyond military discipline,' Bertolaso, who holds the rank of minister, said late [yesterday]. 'The Americans are extraordinary, but when you are facing a situation in chaos, they tend to confuse military intervention with emergency aid, which cannot be entrusted to the armed forces.'" It's as if the original O-purpose was to replace the Haitian government, control the populations, and make a mere show of faking concern for the dying. A normal/heroic president would have sent thousands of people, military or otherwise, on the first day, with pry-bars, sledge hammers, jack-hammers, chains, food and water dropped by airplane to feed the workers, so that many could have been pulled out of the rubble before it was too late for them. There was NOTHING of that sort...UNTIL it was too late. "On her way to Montreal, Mrs. Clinton praised a [Haiti] plan the administration had developed with the private sector, including an effort by her husband, former President Bill Clinton, who is U.N. Secretary-General Ban Ki-moon's special envoy for Haiti. 'He had just had a conference with 500 business people. They were signing contracts, they were making investments. Twenty-four hours later, we get this terrible calamity,' she said in reference to the 7.0 magnitude quake on Jan. 12..."
Hmm. What a coincidence. Maybe Bill knew it was coming. The first line in the article is like so: "The Obama administration wants to use a plan for rebuilding Haiti it had before this month's earthquake..." Down a bit: "...'It was not an exaggeration to say that at least 10 years of hard work awaits the world in Haiti," [Bill] said. 'We must work to ensure that every resource committed, every relief worker, every vehicle, every dollar is used as effectively as possible.'" Something smells of a robbery in progress. Is this the start of something new by global initiators? To ruin third-world nations, then build them up to their own liking with money taken from global citizens, perhaps lots of interest going to International bankers when borrowed money is the last resource, and finally leave the re-built countries indebted to the West for centuries? Ahh, Utopia; can't get better than that, hum? This Haiti project was already planned before Obama knew the Massachusetts massacre was coming to him. A year ago, he didn't know that things could go so wrong. Now he's got the added problem of being an accomplice to Clinton's Haiti initiative, a nightmare in the making. The fact that Clinton would say, "every dollar is [to] used as effectively as possible," signals to me that he's robbing the world the best he can. What business is Haiti's re-building to the 500 businessmen that Clinton met with the day before the quake? Do we imagine that these men want to GIVE something to Haiti??? Polease, somebody call the police, there's a crime in progress! It's not by chance that Bill has become a big gun in globalism. BUT, God enjoys putting big shots in their places. "Britain stepped up its push for a global tax on financial transactions [yesterday] as part of broad plans to reform the banking sector following the financial crisis, amid concerns that the US [i.e. Obama] may act alone. Prime Minister Gordon Brown insisted that his proposal for an international levy on financial transactions was 'gathering support around the world,' a day after Chancellor Alistair Darling hit out at US proposals." The Obama push does not necessarily mean that he (or Brown) oppose bankers; it's easy for banks to pass the fees to their customers so that ultimately the people pay for the money that Obama loaned the banks. Therefore, if the people are really dull, they will appreciate this bank-fee scheme. More than nearly anything else at this time, as Democrats make the Republicans appear banker-friendly, Obama needs to appear somewhat aloof from bankers. Obama is vocal supporter Bernanke's next term, making him appear international-banker-friendly at such a bad time for anything of that sort...so that the banker fees give the opposite impression just when its needed most. Obama came out and started pushing the banker fees as soon as Scott Brown won the Massachusetts election, which election is the very reason that Bernanke's next term is now in doubt. In other words, the banker-fee push coincides with the threat against Bernanke. I would go so far as to suggest that government-enforced corporation fees will be the new hope of "taxing" the global order for global causes. BUT, the fools ought to know, God has the last choice on whether such schemes will succeed. There are other Scott Browns ready to spoil liberal causes at the last moment. Higher taxes on the rich, another Democrat methodology, will cause the rich to increase their product prices so that, ultimately, the people who purchase goods from the rich will end up paying the increased taxes. It's a no-brainer. Better yet to clamp down on price-fixing and over-pricing; the poor of the land will then be able to purchase more with what little money they earn, and the rich won't be able to "steal" so much from all. A country has no dire poverty where there are no "filthy rich." In God's kingdom, it will not be legal to gouge. It's acceptable for a plumber to make twice as much as a laborer, but not five times, for then many laborers will need to pay five times their wages for plumbing services. That's gouging. Wasn't it both gouging and price-fixing when the cost for repairs in virtually every car-mechanic shop more than doubled over-night? Governments didn't protect us because they loved the higher prices and the higher incomes, for then they raked in more taxes from both situations. It's much better to make money on volume of sales than on high prices. The greedy and lazy business person raises prices to make as much as possible with as little work possible; that's how a spoiled generation behaves. The answer to a righteous society is to follow this rule: the more a corporation makes by volume, the less the mark-up should be. Is it right for a singer to charge the same profit when selling 10,000 CDs as when selling 10 million? Why would such a person selling 10 million be called a "star"? Isn't "pig" closer to the truth? An owner of a large and successful company gives much money to charity (because it's expected) but refuses to raise the wages of the company workers, forcing them to live at poverty-line levels. Unions are not the answer because they create states of conflict between workers and bosses. The solution is profit-sharing with workers, with workers making much more money than the corporate bosses. How to fix health care?? Make it more affordable. The medical establishment is not crying for lack of food; doctors cry only because they can't afford their third recreational property. Doctors are not all angelic; some will treat us as fraudulent car mechanics would, just to afford payments on a third property. They'll replace parts in your body that don't need fixing, and may even turn your screws the wrong way to break something deliberately. Armageddon isn't coming because the world is filled with honest and considerate people. The mayor of Russia will not legalize a gay-pride parade, putting American mayors to shame. It might be more tolerable for Moscow on the Day of Judgment than for Washington. Don't kid yourself. Washington is about 85 percent liberal. It won't escape. God believes in censorship, and his freedoms do not allow freedoms wanted by liberals. God's freedoms are to do the right. Russia and NATO have just made a deal to make a deal, that this coming May the two will get together again to see whether the deal to make a deal can actually become a deal by 2020 [snore]. Meanwhile Iran's top war people are meeting in Russia for three days this week as the West begins to put into motion sanctions on Iran. Russia has just stated that this year, FOR SURE, the Bushehr nuclear reactor in Iran will be in operation. I don't see how NATO could possibly make an arms deal with Russia under these circumstances. I say that there will be a deal when Gog's successes in the Middle East become wild; Obama-NATO will then be on its knees agreeing to the deal. The following headline may be a sign of things to come: "US commander signals peace talks with Taliban." There is also this other BBC headline, "Afghanistan's Karzai moots Taliban peace scheme." This could be part of the "new Obama," calling it quits in Afghanistan, OR, it could be the "temporary Obama" while he gets over the jitters. "Treasury Secretary Timothy Geithner is denying that he was involved in withholding information about deals that sent billions from the bailout of American International Group Inc. to big banks. ...Geithner faces criticism from the House oversight committee for decisions that might have cost billions more than necessary [no kidding?]. A bailout watchdog says Geithner should have demanded concessions from banks when he was president of the New York Federal Reserve Bank. Lawmakers are concerned about e-mails that show New York Fed officials demanding the deals be kept secret." Another article shows Geithner in a photo, three positions down from Obama, and suggests that this is proof Geithner is on the way out. "Geithner has been under sharp criticism for being too cozy with Wall Street and for being resistant to tough regulation. There are a lot of fantastic reasons that Obama should throw Geithner under a bus -- not the least of which is the political capital he would gain..." This aloofness from Geithner could be a temporary Obama until he gets over his political jitters. Obama has recently put his weight, officially, behind the troubled Geithner. BUT, just in case Geithner's troubles become humiliating, Obama has positioned himself as not banker-friendly. I don't think it's a coincidence that the bloodline topics have led to the Meschin and Clare merger, with proof that Obama traces back to their Randolph branch in Moray. The message coming through to me is that, if God has been directing these topics, it's for the purpose of stressing Obama et al in end-time prophecy. In other words, the president of America today might be America's last. The Romer surname has been lumped into these very Meschin-Clare bloodlines ( e.g. the Romer Coat, using mascles, appears as a version of the Rouen Coat), and so let me remind you that Obama's chief economist is Christina Romer. If Obama is the False Prophet destined to enforce the Biblical mark of the beast, then Romer et al should play a part in its enforcement. "With economist Jared Bernstein, Romer co-authored Obama's plan for economic recovery." She attended college in Massachusetts. Bernstein (Hebrew surname, black bear on white) is a Biden-faithful economist. Romer is the chairwoman of the Council of Economic Advisors (reports to Obama), chaired by Bernanke in 2005-6, then by a Lazear surname until Romer took the position in 2009. "Lazaer" evokes the Lazzard/Lazer surname of world-class banking importance (e.g. Lazard Brothers). Christine's husband, David Romer, worked for the Council in the early 1980s. "[He and Christina] have adjoining offices in the [economics] department, and collaborate on much of their research...Greg Mankiw [chairman of the Council of Economic Advisors] served as best man at their wedding (Romer served as best man at Mankiw's wedding)." "...The US taxpayer has been systematically looted out of hundreds of billions of dollars'...Goldman Sachs is posting record earnings and will invariably be preparing to pay record bonuses, not nine months after the firm was in mortal danger?" "During the early 1980s, Peter Geithner [= Timothy's father] oversaw the Ford Foundation's microfinance programs in Indonesia being developed by Ann Dunham, President Barack Obama's mother..."
The article says that the Geithners arrived to Philadelphia from Germany. I cannot find a Geithner Coat, but the Gath and/or Goth surname comes to mind. The Geithners were from Zeulenroda, Thuringia (for new readers, the Pollocks have been traced (by me) solidly to the Turin family, which should link to Thuringia as well as Turin in Piedmont). Zeulenroda is in the district of Greiz, which is interesting because entering "Gath" brings up the Irish Grath Coat, surname first found in County Clare. This Coat uses the stag design used by others in the Macclesfield discussions (recent updates). We see it with red lions on white in the Irish Grath/Raith Coat. Since I'm on the verge of investigating Meschin roots in the Burgh surname, it's perhaps not coincidental that "A subcamp of the Buchenwald concentration camp was located at Berga/Elster during World War II." Not only is this Berga in Greiz, but Greiz is beside Burgenlandkreis. Tim emailed last night after reading on Geithner yesterday; he was able to find a Bavarian Garthner surname using a white scallop. It's half on a black shield so as to match the Meschin scallops. The surname is said to be a variation of "Gardner," which sounds acceptable. I recall tracing Obama's Wolfley line (his ancestor in Germany was Johann Conrad Woelflin; the family changed the surname to Wolfley) to the Gard surname as per the "gward" motto term in the Welsh Wolfley Coat. The wolf in the Gard Coat is identical to the wolf in the English Wolfley Coat, you see. I also recall finding evidence that the Wolfin/Wolfley line merged with the Meschin>Randolph line. I had already pointed out that the Wolfley surname was first found in Cheshire, but now I can add that the Welsh Wolfin surname was first found in Pembrokeshire, the place ruled by Strongbow Clare. It's amazing that the Gard Crest uses a hawk's lure, because what is written in the two paragraphs below was written two days ago (i.e. two days before the two paragraphs above were conceived). Believing that the Meschins were from the marriage of Herluin de Burgh/Conteville to Herleva de Falaise, I checked similar surnames for further clues. The English Herl/Hurl Coat is essentially the Meschin Coat with ducks, but it's hard to say at this point whether it was in honor of HERLeva (the Conqueror's mother), or HERLuin. I suspect the latter, although Herleva was born in Falaise, of Calvados (Normandy), while the Briquessart>Meschin line was of the Bessin in Calvados. Entering some of the variations such as "Hurl/Hurrel/Herrel" brings up the Scottish Hurl Coat...using a hawk's lure. That symbol (in the color purple) came up in the Cheshire surname (on January 12). It's Rockefeller-interesting that the Hurls have a Herault variation, for [The Roque surname] comes from when the family lived in La Rocque, in l'Herault, Languedoc." So, you see, the Gards link to the Wolfleys of Cheshire, while the hawk's lure of the Gards should connect with the Cheshire surname, first found in Essex where Obama's Dunham line was first found. On January 12, I also mentioned that the Seabald surname uses hawk's lures, but now see that the white fleur-de-lus on red of the Seabalds matches the same in both the Massey Coat (surname from Dunham Massey, Cheshire) and the Irish Brick Coat. The latter surname was investigated because it could be derived from the proto-Meschins i.e. the Briquessarts. IN FACT, I'm convinced already that the Bricks were from the Briquessarts. A few days ago, an emailer informed me that both she and her husband are from the Patterson surname. The Irish Patterson Coat uses white scallops too (on blue), while it's black lion on white has blood droplets, evocative of the black Sam/Sammes Coat. We can assume that the Sams were related to the Samms/Samsons (who use white scallops on black like the Meschins). I'm seeking evidence that Pattersons link to the Patricks, the latter using the black-on-white Maxwell saltire. I'm convinced already that the French Breque/Brech surname, from Normandy and using a lion in the Meschin white-on-black colors, is linked to the Briquessarts. That clue should link the Brecks to the Meschins too. The Breck Crest uses what looks like a gazelle, a symbol that I had linked (months ago) to the Gascones; the Gaz Coat uses garbs, a Gascone symbol. Remember, Ranulf le Meschin had a mother of the Goz surname i.e. Ranulf de Briquessart married that woman. PLUS, the Brecks were first found in Shropshire, where Meschins were first found (Seabalds were to the south side of Shropshire, in Hereford). I'm thinking that the Pattersons of Ireland were linked to the Irish Bricks, and that the Shropshire Brecks (lion in colors reversed from the Pattersons) were linked with English Pattersons but called Patricks. Seeing that the Patricks use the Maxwell saltire, while Pollocks (pelican symbol, I suspect) were a Maxwell sept, is it a coincidence that the Scottish Pattersons use a pelican-on-nest in both Coat and Crest...the symbol of the Arthur surname as well as the Pulciphers of Cheshire? The emailer whose bloodline is Patterson said (some months ago) that her first name, Jennifer, is from "Guinevere," and that she thought her bloodlines were somehow connected to the Arthurian cult...judging by all that I had been writing on it. The Scottish Pattersons were first found in Ross-shire, and meanwhile I traced the Russells to Ross-shire elements. Therefore, it's not likely a coincidence that both the Russell and Patterson Chiefs use three white scallops, while the other symbol of both surnames is an upright lion. There has long been a Rose clan in and beside Ross-shire. As per Richard Banister, who passed his Yorkshire holdings to the Meschins (see Meschin write-up), see the Banister symbol, the same symbol used by the Scottish Rose/Ros Coat. The Rose write-up: "The Rose family lived at Roos in the East Riding of Yorkshire before migrating north to Scotland." Entering "Roos" brings up the Scottish Ross Coat, of Ross-shire. Tim just emailed to tell of his discovery that a Rousell location named after the Russells (or vice versa) was re-named, "Rousset." ZOWIE, although I wrote back to him saying that I could not find a Rousset(t) surname, I DID later find the Russet(t)/Roost Coat, and I kid you not that I had forgotten what symbol it used when writing the above on Patterson links to the black-on-white Patrick/Maxwell saltire and to the Russells. The Russett/Roost Coat uses a black-on-white saltire!! It has black-on-white crosslets too, the Davenport (of Macclesfield) symbol. The Rusette Coat is in Rosicrucian style. On January 20, Tim had sent a map to show that there is a Rousset less than two miles south-east of Sauviat-sur-Vige. You may recall that on January 20 I re-discussed the "sara" motto term in the Russell Coat; it had earlier (fourth update of January) been traced to the Sauers, then the Sau/Sava river, and finally to the Sava/Savage surname of Cheshire. On Januray 20, I showed that the Savage/Sauvage surname uses black lions (on white, like Pattersons), as does the Sauviat-surname Coat, and that the "Inhabitants [of Sauviat-sur-Vige] are known as SAUVIGEois". I concluded that "These revelations should trace [mythical] Ector and/or Kay back to the Sauviats/Sauvages." As mythical Ector and Kay represent Arthurian bloodlines, keep in mind that the Wolfins (also "Waldwins"), and therefore the Wolfleys of Cheshire, according to the Wolfin write-up, descend from Gualgnain or Gwalwynne, king Arthur's sister's son. Apparently, a myth writer used "Gwaldwynne" to indicate the Wolfin/Waldwin bloodline, and made him Arthur's nephew. I still haven't found the origins of the Burghs. I just checked and found a write-up suggesting that the Falaise surname was possibly from "Fallis." This is a very good discovery, as the "tanner of Falaise" was the grandfather, via Herleva, of the Conqueror. As one can see, the English Fallis Coat is identical to the Italian Fallis Coat, a white lion on blue (colors reversed from the Macclesfield lion). The colors are those of the Valais/Valois crescents and of the Valance/Valen bars; the Falen Coat uses a greyhound, as does the Valais Crest. In the fourth update of January, a "Vaillance code was found in the Acton Coat, that surname being revealed as mythical Ector, also called "Anton," a code that I think refers to mythical Antenor, founder of the Veneti. The Italian Fallis write-up says the surname was first found in Venice!! Variations shown of the Italian surname include "Faillon." BEHOLD!! Luckily, I decided to check the Phalon variation, and bingo! Compare with the Brick Coat. It's a spectacular match, even to the Crest!!! It's spectacular because the Bricks have just been traced to Ranulf le Briquessart's family, whom I traced tentatively to Herleva, daughter of the tanner of Falaise! Note the same Fallis colors in the Phalon Coat!! Note the "Failon" variation of the Phalons. ZOW-WOW! This update has lived up to its title, "Unmasking the Meschins." I think what happened is that the Burghs=Briques=Bricks were able to adopt the Falaise symbols, owned by Herleva by marriage, when Herluin de Burgh married her. BEHOLD SOME MORE. You may have been reading me when I linked "Valais" (including Swiss Valais/Wallis), and therefore "Falaise," to the Rockefellers. Just now, I decided to check who else uses white clovers on blue, as does the Fallis Coat, and one surname turned out to be the "Jewish" Fellers! That was shown on June 9, just after showing the Fell Coat: blue diamonds on white...as in the Brick and Phalon Coats!! It was necessary that the Obama lines should lead back to Rockefellers, explaining also why Obama's mother worked for them. The party-line 60-40 vote was successful only because Republican Sen.-elect Scott Brown has yet to be seated. Sixty votes were required to approve the increase. The measure would lift the debt ceiling to $14.3 trillion. That's about $45,000 for every American." Knowing that even Democrat voters do not want the Obamacrats to borrow/spend more money, they are doing it anyway. Perhaps they feel the extra money can be used to "purchase" enough votes for the elections later this year. If it works (it didn't for Bush), expect them to borrow more money again to buy more votes for 2012. The truth is evident and surreal: the Obamacrats do not want to go forward in power without hope of fulfilling a very expensive agenda. They are risking all power in order to have money as their working tools. It's obvious that the money is NOT to be used for the concerns of the peoples, but to make it appear that it is. "[Hillary] is not, unsurprisingly, speaking publicly about her intentions beyond saying, as she told PBS's Tavis Smiley in an interview that airs Wednesday night, that she is 'absolutely not interested' in running again for president of the United States. But in the same interview Clinton...cannot see herself serving in the same post in a second Obama administration." It's only one year in, and she's already telling the world publicly, that she won't join Obama in 2012. She, could, therefore, conceivable quit before 2012, for any off-the-wall reason, knowing that her supporters would want her to challenge Obama on his declining wave of popularity. The situation would be the perfect reward for two packs of wolves. Guess who gets to spend the new Democrat money? Geithner. How then, could it be, that Obama and Geithner are not playing footsies under the table, looking forward to fulfilling an identical agenda? I neglected to point of that Ranulf le Meschin's uncle, Hugh D'Avranches, as well as the latter's son, used wolf heads for symbols; I can therefore announce, for the first time, but only tentatively, that Hugh's family (Cheshire) was linked to the Obama-line Wolfleys. Hugh used the wolf in white-on-blue, the colors of the Rockefeller/Falaise-related Coats shown late yesterday (that discussion was of great significance for those who want to trace the line of the "tanner of Falaise"). I neglected to mention something else in yesterday's update because it didn't dawn on me until later in the day. It was suggested that "Garthner/Gardner" was a variation of "Geithner," wherefore Geithner comes from the Gard sector of wolf-symbolized families that I link to the Wolfleys of Cheshire. What I neglected to point out was the similarity between "Garthner" and "Gernon." The latter term was the surname used for Ranulf le Meschin's son, also an earl of Chester/Cheshire, in regards to Gernon, a location in Normandy. So I started to investigate Gernon-like terms. I found some amazing things. I had already shown (fourth update of January) the sword design of the Dunn Coat in the Pollet/Paulet Coat when discussing the origins of the rulers of Dunham Masci (Cheshire), but now I find the same sword design in the Gerner Coat! This tends to support a trace of the Dunn/Dunham surname to Dunham Masci (a "Pollet" motto term is found in the Pull Coat, surname first in Cheshire). Note the similarity between "Gerner" and "Garthner/Gardner," and let me add that entering "garner" brings up the Gerner Coat. But there's more. In the Wolfley write-up, we read that Wolfleys "Held a family seat in Longdendale". The Longden Coat (surname first found in neighboring Derbyshire) uses a two-headed black eagle on white, smacking of the two-headed white eagle on black used by the Scottish Dunns. Amazingly, the Scottish Dunns were first in Angus, where the Ectors were first found, and while I showed that mythical Ector's son, Kay, and the Kay surname, likely developed a key symbol because the surname is said to be derived from "key" (not necessarily derived from that term), so we find a key in the Crest of the other Scottish Dunn Coat (the one with the Gerner sword). Apparently, the Cheshire Dunns (Arthurian Dane Rus?) merged with some sector of the Kay clan, and at this point I should mention that Shaws (their lines use a key symbol too) were first in Perthshire, beside Angus, while a variation of Shaw is "Shay," what could have become "Kay." NOW NOTE: The Irish Shay Coat uses fleur-de-lys in the Masci colors, AND it uses what appears to be a variation of both the Dunham and Randolph dancettes!!! I would not have made this discovery had I not made the Kay link to Shays. For further investigation, see that the Kees link to the Forbes by common use of the harnessed bear and stag head. See also the dancette of the Chee surname, first found in Cheshire, but as the Chee variations are Kettle-like, see the Kettles of Perthshire. As the Kettels appear named after Ket(t), see the Keith Coat too, for the two stag-using families use "vince" and "vincit" in their mottos. Back in April, I got an email from a Mr. Hampton, telling that "My immigrant ancestor John Hampton and family from Kinca[r]dine, Clan Keith (said to be Cati from Germany)..." I just checked the Cardine Coat, therefore, and found the surname to be first in Cheshire! Plus, the Cardine Crest uses the same wolf-head design that I've traced several times to Obama's wolf lines. It can't be a coincidence that the Cardine motto uses "fide" while the Scottish Fido surname "is derived from 'Fiddes,' the name of a barony once known as Fothes or Futhos located in Foveran, Kincardineshire." This Fido/Fiddes Coat uses a stag and black star, evocative of the same in the English Doun/Down Coat. I traced the Wolfin bloodline to fido-like motto terms (because the English Gard motto uses, "fidel") and therefore to the Fiddle (and possibly Fichtel) surname, wherefore I do not think it's a coincidence that I've just learned the Nobel motto to be: "Fide et fortitudine." The Penrith Arms motto is, is "Fide et Fortudine," and the English Penders use, "Ex fide fortis" (I linked the Penriths and Penders to the Pendragon cult in the previous update). The Penrith-surname Coat uses a wolf head." It's the same wolf head exactly as in the Cardine Crest, AND the Penrith Coat uses a dancette (!) in the colors of the Chee/Cheatle surname that led me to the Keith surname in the first place. We're keeping in mind that the Obama Wolfin line is traced, by others, to king Arthur's nephew. We get the impression, therefore, that Obama belongs to the Roundtable Illuminati, and that the false-Christian cult of king Arthur rules the world by power of their money. The Keiths were first found in Haddington (Scotland, next to Lothian). I decided this to be important enough to check Haddington out, where I found that it is East-Lothian important, and that East Lothian's "largest town is Musselburgh." Hmm, that so evoked the mascle symbol of the Meschins/Masculyns, that I entered "Mussel" to find yet another variation of the Meschin Coat! Note the Maslen/Maslin variation at the Meschin page. PLUS, seeing that Meschins use ESKallops for a symbol, "[The Roman builders of Musselburgh] built a fort a little inland from the mouth of the River Esk and bridged the river here...The name Musselburgh is Old English in origin with mussel referring to the shellfish." Keep in mind that the Goz bloodline (of Ranulf le Meschin and Hugh D'Avranches) has been traced (by me) to the Easkals. Yes, that's a black wolf in the Mussel Crest! The Mussels were first found in Lincolnshire, a realm ruled by Ranulf le Meschin through his marriage to Lucy Taillebois (of Mercia), the mother of Ranulf de Gernon. The question is, does the "burgh" ending of "Musselburgh" relate to the Burgh surname that I've just traced these Ranulphs to??? BEHOLD something that was found months ago but forgotten until finding it again here: the Mascal Coat is exactly the Keith Coat. That is, when entering "Mascal," the Keith Coat comes up. Therefore, Mascals named Musselburgh, or vice versa. The Penrith motto uses "celeriter," suggesting links to the Keller/Kelner and Celler families. I now see that the Scottish Celler Coat smacks of links to the Mussel Coat, adding further support to the theorized Meschin-Arthurian links. The wolf-using Welsh Penriths were first found in Glamorgan, exactly where I've traced the Mitch/Muschat/Montfiquet surname's red triple chevron on white (remember, the Mitchell Coat uses a variation of the Meschin and Mussel Coats). The Penders, which use "fide fortis" in their motto, were first in Cheshire! The Irish Penders/Pendergasts were first in Pembrokeshire, where Strongbow Clares ruled. They use "vincit" in their motto too, like the Keiths/Maskalls; in fact, Penders use "Vincit veritas," and Mascals use "Veritas vincit." You may have spotted the red Zionist stars in the Penrith Crest. The same was used by the Wassa/Gace surname, and as that was the proto-Washington surname, see now the Arms of Westmorland, the makings of the Washington Shield. The two Ranulf le Meschins ruled Westmoreland/Mereland, a location that could possibly link to the More of Rollo importance, and/or Moray/Moravia of Randolph importance. Kendal in Westmoreland is conspicuous because the Kendal Coat uses the dolphins of the Cheshire Marleys...that I traced to the Meschin Coat (fourth update in January). Amazing, for the Marley write-up has Marleys originating from "Morlaix, in Brittany." Therefore, it appears solid that Morlaix and Moreland were linked. The Morlays, using the Marley/Meschin colors, were first in Lancashire, where the Washingtons were first found. The Marley write-up reminds us that Brittany was ArMORica...i.e. likely named after Morlaix elements. "America" derives from the Amerike surname of Wales; from the Welshman, Richard Amerike, that is, who was "born in Weston under Penyard, near Ross-on-Wye in England." Weston under Penyard is in Herefordshire, where the Norman-supporting Geurnons were given lands. While in search of more Gernon-like surnames, I tried "Kern." The Irish Kern motto muses "Fidens et constans," conspicuous because I had traced Obama's Wolfin line to lake Constance elements in Germany. In the first update of September, I wrote: "Remember, the Constance Coat uses a pine tree, what I suspected to be the Fichtenberg pine (or is it a fir) tree. It's identical with the Fichtel tree but not identical with the Fichtenberg Arms." First, "Fichten" smacks of the Mitch/Muschat/Montfiquet/Montfitchet surname, but the same update, stressing Fido-like terms, found a Sober-like design in the Cogan surname (first in Glamorgan) to use the motto, "Constans fidei." The Gerner Coat uses an oak branch (lower-most symbol), perhaps linked to the oak leaves of the Sobers and Cogans. Note that the Gerners were first in Rutland (Liecester), for the D'avranches/Meschins were related to Robert of Rhudlan. Note what appear to be red Zionist stars in the white wings of the Gerner Crest, for red Zionists stars on white wings are also found in the Penrith Crest. The Penriths were Welsh, and Robert of Rhud(d)lan was a Norman ruling in Wales on behalf of Hugh D'Avranches. The Geron surname using a red lion on gold should apply to Ranulf de Gernon (son of Ranulf le Meschin) because Gernons use gold lions on red. The Gernon motto uses "Cyfoeth," code possibly of the Fothes/Futhas surname that was alternatively, Fido/Fiddes. Remember, the Gernon surname was "First found in Montfiquet" (Bessin), and the Montfiquet surname used the red triple chevron on white, found pre-Norman-invasion as the symbol of Morgannwg/Glamorgan (Wales)...where the Penriths were first found! The Muschat/Montfiquet link to Penriths might therefore be the first instance of the Meschin link to Pendragon elements. ...a Banes Coat has been found, using the two colors of the French Ban/Bant Coat (uses oak leaves as do the Alans/Allens of Brittany>Shropshire). I'm assuming that the Banes were Banisters because Banes' were first found in Yorkshire. If Banes is a Banis(ter) variation, then Banisters can be linked to the Arthurian cult (i.e. to Lancelot) by the "arte" term used in the Banes motto! TODAY, I can add to this theory because the Ben/Bent surname was "First found in Cheshire and Lancashire [!!!] where they held a family seat from very ancient times well before the Norman Conquest of England..." The Bens/Bents are said to be from Anglo-Saxons. however. I've made the theory (long ago) that "Pendragon" was in honor of Pennine-mountain elements. The Pennines stretch from Yorkshire and Lancashire to Cheshire. I now find that the Pennine/Penning surname uses a dancette in the colors of the Penriths. There is a Benning/Bennine surname (white star on black) that might be related. It's possible that Ban/Bant and/or Ben/Bant was one and the same the Pen/Pendragon family. See the similarity between the Pen/Penn/Penner Coat and that of the Bens/Bents/Bends. Since the Ban/Ben-like surnames are being traced to Banisters of Cheshire, the white star on black of the Bennings could link to the same in the Pulshiper/Pulles Coat (first in Cheshire). I've just learned that the Banes Coat uses the same wolf under discussion earlier in this update!! PLUS PLUS, the French Banes/Bannent Coat (Languedoc) is a red triple chevron on white!!! As the Lance/Lancelin surname of France uses one giant red rose on white, the symbol of Lancashire, the Lancelot myth term might have described that family. It's always a question of whether the surnames were created after myth characters, in honor of them, or whether the historical names formed the basis of the myth-code characters. See the red roses on white in the Arton Coat, the surname first found in Berwickshire, where the Arthur surname was first found. However, the Arton-Coat page shows only Aiton, Ayton, and Aytoun. The Aiton symbol is the same as the Macclesfield and Randolph "fat" cross, but in colors reversed. The Aedon/Eden surname of Germany (Silesia) looks as though it could be related. And of course the Eatons of Cheshire. The English Eden Coat looks Macclesfield/Meschin all over. On the other hand, though not necessarily contradictory, the Aytons look as though they may have been Actons (= mythical Ector, Arthur's man, in my tentative opinion), first found in Cheshire and Shropshire. By the way, I had traced (fourth update in January) the Arthur surname to Hicks/Hykes of Clapton (Somerset), a term that I linked to ExCalibur and the Claver variation of "Clare." BUT, it looks like "Clap(ton)/Clop(ton)" could also link to "Salop," an alternative name of Shropshire. The question is whether "Claver" is a pre-Norman-invasion family that the Rollo Danes linked to in acquiring their Claro/Clair surname. Also, "Salop" may have developed from a silent-c "scallop," in which case I'd tend to trace	(at least in part), the ExClapton sword, so to speak, to the Euskals-Basques. One Clapton/Clopton surname was first found in Warwickshire (bear symbol, like Berwickshire), but the other Clapton/Clopton surtname was first found in Cheshire. The latter uses what looks like a wolf as Crest symbol, which should then link to the wolf of Hugh D'Avranches, ruler of Maclesfield as per the Norman Domesday-book records (1086). The Clapton write-up claims a "Cloptuna" surname in 1154, a dozen years before the Norman invasion. BEHOLD. The Clotton variation of the Cheshire Claptons (said to be linked to Danish nobels) had me entering "Clott"...to find the Sinclair Cross!! Therefore, it would appear very true that the Danish aspect in the Cloptons were of the Rollo Dane Rus. The Clotts, also "Claytons" after their town, were first found in Lancashire. This never ends now that there are so many reliable clues to chase. But, for today, that's it. On FOX news just hours after finishing yesterday, it was announced that Obama and Scott Brown (of the "Massachusetts massacre") are tenth cousins, both descended from the Singletary surname. Look at the white triple chevron on red in the Singletary Coat. The surname was first found in Lancaster. "At the Obama-genealogy webpage below, the Dunham surname of Obama's mother is traced back to his eighth set of grandparents (see "8/GREAT-GRANDPARENTS"), where we then find "Jonathan Singletary alias Dunham, b. Newbury, Mass., 17 Jan. 1639/40... Apparently, the Singletary family created the Dunham surname..."
There's at least two more websites that point out the surname change of Jonathan Singletary to "Dunham." I don't think this was the start of the Dunham surname; it seems that Jonathan was a Dunham somehow. Trying Single-like terms to find where Singletarys fit in, the Singer Coat was found, uses garbs, and "Fidelitas vincit" as the motto. The Sink Coat uses dolphins comparable to the Kendal Coat and Marley Coat. The Singletary write-up says that the surname is from "sengal"; the Sengel/Seneschal Coat looks as though it could be the Macclesfield and/or Randolph cross. There's a Singe surname first found in Shropshire. As per the Shingletary variation, there's an Irish Shing/Shinick surname said to derive from "Sionnach," so I looked to see if there is a Sion Coat, and found it registered under the Swan/Swein family. "Fidelitas" is the entire motto, very significant because it's a term in the Singer motto. In other words, as odd as it may at first glance seem, the Singletarys could be from a Sion bloodline. Less than an hour before writing the two paragraphs above, I was watching the Bill Gaither show...and wondered where my head had been when seeking Geithner variations but not thinking of "Gaither." After seeing it, I wasn't inspired to mention the Gaither Coat because the variations were Cater-like i.e. didn't seem related to "Geithner." Then, in the Shingle=Sionnach write-up: "This most ancient Irish surname is derived from Sionnach, the Fox, an epithet used by the Chief of the Irish Cathernaigh Clann, a branch of the northern Ui Fiachrach." Amazing. One of the Gaither/Cater variations shown is "Cather." So here's my question. Did God arrange me to be writing on the Geithner surname and the red/white triple chevron at a time when He knew I'd be watching Fox's Singletary announcement, just hours before I watched the Bill Gaither show? This sort of thing happens over and over again in my bloodline quests. A few minutes before the Singletary announcement came on Fox News, the astronaut to the moon, Gene Cernan, was questioned. His surname reflects "Gernon" almost-exactly. There is no Cernan Coat but the Irish Kernan/Kernon Coat uses two red lions in the position of the two lions of the Gernon/Gernan Coat. In the Geron/Gueron write-up: "First found in Normandy where they held a family seat at Gueron and were the seigneurie of that area, in the department of Calvados...In 1086 Turstin de Giron or Girounde was an under-tenant of Odo [= from Herluin de Burgo/Conteville], Bishop of Bayou [=Bessin]...This distinguished family were Grand Masters of the Order of St. Jean of Jerusalem in 1231." 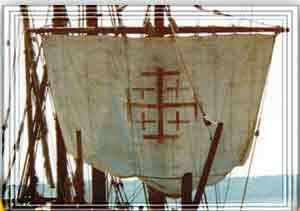 Templars. The Gernon surname of the Meschin rulers is important because the city by that name was in the Bessin where the Meschins lived. The term could tell who it was that Polish-related Meschins merged with when in the Bessin. My first thought is that "Guer" is a variation of "war" and could therefore be a Vere variation (Veres were in Normandy too). But then I thought of the Celts/Gauls called something like "Coruna." Googling the term, I came straight to a Coruna location on the north coast of Spain said to be the founding of an Irish peoples. There's a map at the webpage, showing Ferrol to Coruna's east side and Brigantinos to its west side, not to mention a Marina region nearby. "Ferrol" evokes the Ferrer family of Hugh D'Aranches association, and now that we think of it, "Avranches" sounds Spanish, AND we somewhat expect Spanish elements in the D'Aranches and Meschin families if their Goz surname links to Basques. Plus, as per the trace of the Meschins and Odo to the Burgos, might "Brigantia" apply? The article states that a king Breoghain of eleventh-century Brigantia populated Ireland. See the scallops in the Arms of Coruna: "The coat of arms of the city of Coruna features a silver lighthouse built on a promontory, with a skull and bones underneath. The skull is topped with a golden crown and the lighthouse is surrounded by seven golden scallop shells." Interestingly, the Irish Pattersons use scallops on blue background like Coruna, but the Patterson scallops are white (though that's the Meschin-scallop colors). Hugh D'Avranches used white (wolf) on blue. 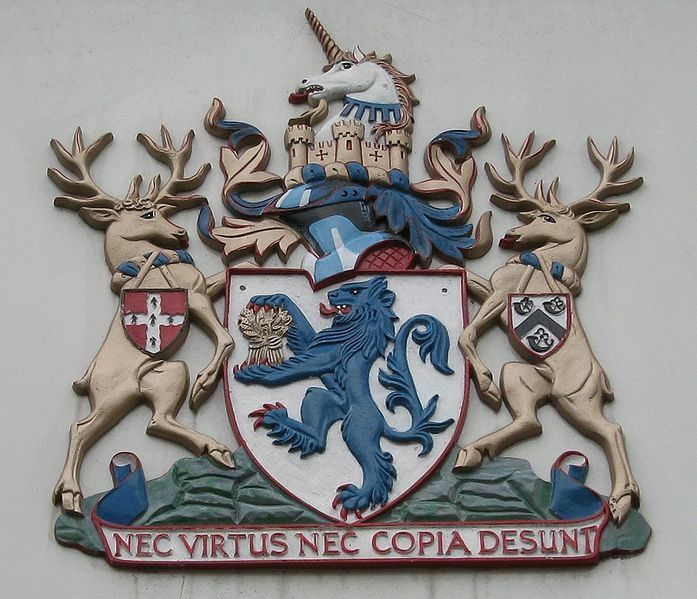 The Camel in the Patterson Crest has white scallops on its blue collar. I've recorded just two surnames with gold scallops on blue: Mallet and Colby. The Colby family could apply to the Pattersons because king Cole ruled Camulodunum, after the god, Camulos, the worshipers of which would likely use a camel symbol. Camulos was the god of the Remi Gauls, of Reims (France). The Remi article at Wikipedia says: "A late legend accounts that Remus, the brother of Romulus, founded the city of Reims..." Reims was a city sacred to Merovingians, who used gold-on-blue symbols (i.e. like Coruna). I've just recalled the name of the Gernon-like Gaulish god that I was looking for: Cernunnos. The Wikipedia article says that the term was from the Gaul word for antler/horn: "carnon or cernon." Suddenly, I'm half convinced already that Ranulf de Gernon was linked to elements of the Cerunnos cult, especially as the stag is all over the Meschin family. The Wikipedia article above shows the "Snake-witch picture stone" with a "triskelion pattern" evoking the Traby Arms, complete with what could be modified to the 666 apparent on the Traby Arms. "Traby" is said to mean "horn" (as for example "tarvos/taruos" means "bull") in Polish (the Traby bugles are goat horns, from the Cretan/Curete goat-and-bee branch of Zeus, the Taurus god). It was suggested earlier in this update that "Herluin" and/or "Herleva" could trace to the Herl/Hurl surname using a Herault variation, so read this: "Lastly, a Gaulish inscription (RIG 1, number G-224) written in Greek letters from Montagnac (Herault, Languedoc-Roussilion, France) reads...thus giving the name 'Carnonos'." Since Randolphs carried [dancette] to the Dunhams, I checked the Randy Coat to find the white triple chevron on red (the symbol of the Singetarys). The Hickman surname, one of the many names in Obama's ancestry, uses the variation of the Dunham rake in the Hickman Coat. I missed the Hickman/Hykeman Coat when discussing the Hicks/Hykes surname in the past several days. The Hickmans use "fidele" in their motto. The Fido/Fiddes Coat (that I think is the basis of fidel-like motto terms) uses a stag, but the Crest is "Two hands coming out of clouds holding a cornucopia." That's the Zeus cornucopia symbol if ever I saw it; the Cretan goat horn became a cornucopia as well as a bugle. The Arms of Macclesfield Borough show three bugles, and a "Copia" motto term. At first, because "Capite" is capitalized in the Meschin write-up, I thought it was the name of a location in Shropshire. Then I learned that it's to be interpreted as "in capite," meaning a land grant by a ruler. Just the same, the investigation into capite-like terms has proven to be important. If anyone is interested in further investigation, the update goes on to tell that the Mallet write-up links the surname to "Malo, a popular form of the name of Saint Maclovius, the 6th century Welsh monk..." The point here is that the Mallet scallops are in the same position, using the same colors, as the Shaw cups/grails, keeping in mind that Shaws have already been connected to the Bez/Bes and Bole surnames that named the Bessin and the Pulls/Pollocks of Cheshire (in my opinion). There is a Norman Malo/Mallot Coat using the Sobieski/Leslie buckle, suggesting Polish roots once again. Possibly, "Mallet" may have created the dolphin-using Hammer surname, and may have been derived from the Martel surname (French for "hammer"). Martel was a big name in the Merovingian saga, especially as related to the Magdalene cult. "Reims" (i.e. a Merovingian and Cernunnos center) was linked (by me) to Romney and Romulus, while the scalloped Romney Shield is identical to the Pullen Shield, and Romulus, Michigan, was founded by Pullens and Poles/Pules. The stag in the Poles Crest could, therefore, link back to Cernunnos. If we should expect Cernunnos elements in Cheshire due to the Poles and Pulls of Cheshire, then we are not surprised that Ranulf le Meschin's son, Ranulf de Gernon, was a ruler of Cheshire's capital city. I've been keeping the theory that these Pole bloodlines tie to the Mormons for more reasons that Mitt Romney being a Mormon. Glen Bech (now on FOX) is a convert to Mormonism by his own admission, and caters his show to an anti-Illuminatist/globalist audience, though he may be involved with the Illuminati faction that I think Michael Savage could belong to or supports. Or, these men may be simply anti-Illuminati and not Illuminatists at all, yet their popularity on radio (Glen Bech has just been found by a poll (pun not intended) to be second, behind only Oprah, in popularity) suggests money-bags behind them, and a global agenda. See the Bech Coat, black stars on white (colors reversed from the Poles/Pules), and a pelican on nest in the Bech Crest...like the Pullens/Arthurs! It appears that the Becks, first in Yorkshire, are linked to the Beckers (stag symbol), first in Yorkshire. I had traced the Becketts of Cheshire to the bee-line Bajocasses of the Bessen. Coincidence? I don't think so, for the German Beckers use the white-on-blue star used by the Bez/Bes Coat. I would tie the Becks to the Bacons/Bachons because they likewise use black stars on white in conjunction with a red and white scheme. Then we have the Bakers/Bachers using white scallops on black (the Meschin symbol); the scallops are on a black saltire, the Maxwell symbol. I had seen the Bech two-fingered (rook-like) cross elsewhere yesterday but cannot recall the surname. I tend to link it to the Rockefellers. This would be a good time to show the Patt Coat, black stars on white, though the surname is more-appropriately "Puttock" and "Putten." I use these variations because they seem to be 'tt' variations of "Pollock" and "Pullen." I am not sure at all that this link can be made, nor that the Patt variation refers to Pattersons (also using a pelican-on-nest). But looking just now for Patt-like surnames that might apply, zowie, an English Peters/Petry Coat uses gold scallops on blue, similar to the (Irish) Patterson white scallops on blue but exactly like the scallops of Coruna (northern Spain). The other English Peters/Petter Coat uses mascles in the colors of the Scottish and Irish Mitchells (whom I've already traced to Meschins); the English Mitchells use gold scallops. Now behold. The Irish Patterson write-up traces to an Irish Casain/Cussane surname, and since the Coruna location is suspect as part of the Basque family to which the D'Avranches/Meschins link, it could just be that Cassain/Cussane is of the Goz bloodline. Indeed, check out the Spanish Gaz Coat that was once shown as the LasCases surname...that (I) linked to the BajoCasses and to the Basques of Gascony (the Gas/Lascases Coat uses garbs, a Gascony symbol). Check out the "Bizkaia" region on this map of Basque Country. "Through the millennia many mythical stories of [the lighthouse's] origin have been told. According to a myth that blends Celtic and Greco-Roman elements, the hero Hercules slew the giant tyrant Geryon after three days and three nights of continuous battle. Hercules then -- in a Celtic gesture -- buried the head of Geryon with his weapons and ordered that a city be built on the site. The lighthouse atop a skull and crossbones representing the buried head of Hercules' slain enemy appears in the coat-of-arms of the city of Coruna." It's compelling to ask whether the skull and crossbone symbol of the Templars refers in particular to the Geryon/Ladon bloodline. I've asked whether Geryon's two-headed dog, Orthos, evolved into the Arthurian cult. Note, in the Basque-Country article, the two wolves under a tree that could depict the apple tree of Laden's Hesperides garden. I've found FE's discovery: it's "Geroy" or "Geroie" or "Giroius." At the website below, Geroie Montreuil had a son (with Gisela Bertrande): "Ralph Mala Corona (Giroie)." Mala? Corona? Giroie ancestry is, in the genealogy tree above, in the Le Gros surname, BUT at another page we find: "Geroy (Giroi) LE GOZ. DE MONTREUIL. 968 [AD] -. Gisela Bertand DE BASTENBURG." Or see here. I suppose that "Goz" could have evolved into "Gros" by way of "Giroy." Another website shows a Beatrice Goz who's daughter married into the Brionne/Crispin branch of Sinclairs/Clares. For more info, see (in the below) the "Family of Giroe," where we find that Raplh Malacorona died as a monk i.e. reminds me of St. Malo centuries earlier. The same page tells that Hugh D'Avranches grandfather was "THURSTAN 'le Goz' (-[1045/55]). Guillaume de Jumieges names 'Toustain surnommé Guz, fils d'Ansfroi le Danois'" There's that Danish link again. And we now have a "Guz" variation to check. The Gus Coat is from Baden (Germany), and there is a Cuss variation smacking of the Cussanes of Irish Pattersons. I suppose it's possible for "Geroy" to evolve into "Geron/Gernon," which itself smacks of Geryon. This could mean that the Geryon and Cernunna cults were one and the same. Thinking further about this makes a very ancient Meschin-Arthur link if Geryon's dog (Orthos) represented the Arthur bloodline. In other words, Geryon and Orthos depicted the Gernon and Arthur bloodlines, and afterward, the Polish-Moravian nobles in the Bessin merged with the Gernon fold, some becoming Pulls, others Meschins, others Samsons, others Pattersons, Patricks, etc. The Vaux write-up tells that origins were in Vaux, Normandy, in relation to a realm of Gillesland. We then find that the French Gilles/Jilles surname 1) was first found in Lanquedoc; 2) is in the colors of Vaux; 3) uses red lions on gold, the old symbol of the Wells who were a Vaux branch. In fact, "Gilles" could be a Wells variation. The Scottish Jilles/Gilles Coat uses Vaux-like checks/diamonds in green and gold. For new readers, I traced the Mary Magdalene cult to a red lion, to the Vaux family, and to the red and gold Allens who used a red lion on white as Stewarts. Earlier in this update, surnames related to this discussion use fidel-like motto terms, especially "fidelitas." Here I now find that the Gerry motto uses "fideliter." There are two surnames that I hold out as pertaining to these motto codes, the Fiddlers/Fidelows, and the Fidos/Fiddes. NOW, seeing the green ring in the Gerry Crest, see the same green ring in the Fiddler Crest! A green ring (officially a "chaplet") is found also in the Ross Crest and the Hicks Crest (the latter uses a Shield much like the Allen/Alan Shield). The red-on-white lion of the Ross' should be linked to the same in the English Gerry Coat. The latter's write-up is important for revealing Gueron of Normandy, the origin of the Meschin Gernons: "But Saxon surnames survived and the family name was first referenced in the year 1086 when Guericus Guery (Warre or Werre) held estates in that shire at the time of the taking of the Domesday Book." It would appear, therefore, that the Gerry surname was in fact linked to Gueron (if not also to the Veres). Yesterday, it appeared that the Pattersons were linked to the Coruna (Spain) branch of Gernons (if indeed Coruna was a Gernon branch), and now I find Gerry links to the Ross family...of Ross-shire, where the Scottish Pattersons were first found. As these Pattersons use the pelican in the Stewart Crest, I'd say Pattersons also linked to the Allen bloodline. I don't know why it took me so long to see it, but the Scottish Patterson write-up derives the surname from "Patrick," what I had suspected...because the Patricks use a saltire in the colors of the Maxwell saltire. Thus, Pattersons do seem linked to the Meschins/Gernons. I'll record the "gerge" motto term in the Scottish Patterson Coat because it might be a Gerry variation somehow. I did (tentatively) trace mythical Geryon to "Gorgon." Unfortunately, I have seen the English Gerry Coat and Crest in a surname treated over the past few days, but I did not record it. As per the Grenon variation of the Gernon surname, note the Templar cross of Jerusalem used by the French Grenon Coat (surname in Normandy). This cross was used by Godfrey de Bouillon, though it morphed into the Bouillon-cross design. Note how little is said on the Grenon family. Might the green ring have been used after "Gren," since after all the Grenons use a green shield? In French, green is "verde," evoking the Veres/Weirs. Hmm. The Green-surname Coat uses stags (Cernunnos symbol) and "Virtus semper viridis" for a motto, an obvious play of "verde." I have seen the semper term many times, and have shown the Semper Coat before. It uses two red lions on gold, the symbol of Normandy but may then link to the lion of Gerry. Amazingly, the Semper surname is said to derive from "Saint Pierre/Petro," and the English Peters were traced to Coruna yesterday (because they sound like "Patterson/Peterson" and use Coruna's gold scallops on blue, not to mention mascles). I should jot down that the Gironde department has a Langdon location that may link to the Longdendale part of Cheshire held by the Wolfleys. There is also a Spanish Giron Coat if you're interested. I've been anticipating a Geroie investigation for over a month (since FE found the surname), but I was waiting for the topic to come up naturally at a right time, for at the time I had nothing to link the term to so that it seemed pre-mature to discuss it. I did not know how the topic would veer to Geroie, nor did I know whether the Meschin-Goz topic would become central again. I did not know then that Ranulf le Meschin's son was styled "Gernon." But here we are...finding the Geroie/Geroy term much larger than expected. In the same way, my Patterson email friend keeps egging me on to topics that I'm not ready to get into, only to find that eventually I'm onto them. It's amazing that the Geroie topic welds solidly to the Pattersons (so far as my opinion is concerned). I don't think she relishes being tied to Gorgons, though. Arthurian myth characters are on the romantic side, but, caution, the cult is the devil's. I've just made more links that look acceptable. As per the Garonne river, I tried various Gar(r)on-like terms, and came to the "Sero sed serio" motto in the Scottish Garr/Kerr/Carr Coat. It reminded me of the "Che sara sara" motto of the Russells (who are tentatively linked to the Pattersons). Recalling that I had traced the Russell motto to the Sawyer surname, I took another look at the Sawyer Coat and saw a "trouveras" motto term. This reminded me of the "trouve" motto term that I had seen an hour earlier in the English Gerry Coat! PLUS, the Sawyer motto uses "Cherches," very reflective of the Patterson "gerge" motto term. PLUS PLUS, as per the Russell link to the Meschins, the Sawyer Crest uses a Labrador (dog) that is technically called a "talbot." I get it!! The mother of Ranulf de Gernon was Lucia Taillebois (of Mercia). The Talbot Coat (surname first in Shropshire) uses a red lion on white, the Russell-lion colors (see same lion in the German Sauer Coat)! The Talbot shield-on-shield was traced to the Maxton area of Roxburghshire, e.g. the Scott surname, an area to which I also traced the footless martins e.g. the Rutherford-of-Maxton symbol. It's in the Scottish Scott-Coat write-up that we find the surname traced to Roxburghshire, and this Coat (Masci colors) uses "Amo' as the entire motto, a term that I'll trace to Hamo de Masci of Dunham Masci (Cheshire), for the stag in the Scott Crest is of a design that comes up often in these families. I'm assuming that "Raith" is the Irish "Ruth(erford)." The English Stewarts use nearly the same stag design along with a red lion on white. "Some of the world's most prominent bankers have come out in favour of a global bank wind-down fund, a concession from the industry after weeks of fighting proposals for new taxes in the US and Europe. Bob Diamond, president of Barclays, also supported the idea of a global levy, which could see banks contribute tens or even hundreds of billions of dollars over a period of years." "Officials, including U.K. Chancellor of the Exchequer Alistair Darling and U.S. Representative Barney Frank, who chairs the House Financial Services Committee, countered that banks shouldn't argue against reforms. Today, Frank said banks 'got the message' on the need for more regulation. He said there was 'general agreement' on the need for global coordination..."
Not all banks are a part of the Bilderbergs, and any global scheme that appears to abuse banks will allow a safeguard for Bilderberg-friendly bankers, we can assume. It was reported in the news yesterday that Florida refused to take anymore Haitian patients until Washington agreed to pay some of the costs. Indicating how little the Obama administration cares for the lives of Haitians, it then cancelled all flights carrying injured Haitians to Florida hospitals (that had taken about 500 to that point). Obama, of course to no surprise, came out with a statement later in the day claiming that money was not the issue, the problem instead being that the administration was seeking other hospitals to land the patients. The problem (aside from Obama not wanting to pay the cost) could be that the O-people have been tasked with getting the injured to hospitals where Globamists make the money for treating the people. "Officials were forced earlier this month to retract inaccurate claims in the IPCC's report about the melting of Himalayan glaciers. ...In its most recent report, it stated that observed reductions in mountain ice in the Andes, Alps and Africa was being caused by global warming, citing two papers as the source of the information. The revelations, uncovered by The Sunday Telegraph, have raised fresh questions about the quality of the information contained in the report, which was published in 2007." In other words, there was no science to back the idea of melting Himalayan ice, so the global-warmers used the word of mountain climbers and fashioned it as solid science for the world to swallow. "'We are continuing to build,' Netanyahu vows after planting tree in West Bank. Ariel is the 'capital of Samaria' and an 'indisputable' part of Israel, pledged Prime Minister Binyamin Netanyahu on Friday afternoon just after he planted a tree in the fourth largest settlement city in the West Bank." Netanyahu may have been moved to Obama's back burner, but I'm sure Obama is eyeing the dial for to turn that heat up as soon as he can, once he finds a way to do it without losing more political points. Of the 45ish percentage points of Americans who still favor his work as president, a sizable power block is controlled by American Hebrews. "The IDF's [= Israeli] rescue operation in Haiti received praise [January 28] from former US president Bill Clinton, who is the UN Secretary General's Special Emissary to the Caribbean disaster zone. Clinton mentioned the hospital at a round table session on philanthropy held [January 28] at the International Economic Forum at Davos, Switzerland, in which Israeli President Shimon Peres was also a member of the panel. Addressing Peres as the audience looked on, Clinton said: 'Shimon, I don't know what we would have done without the Israeli hospital at Haiti. The Israeli hospital was the only operational facility which was able to perform surgery and advanced tests.'" "Additional participants in the plenary session included Melinda Gates, co-founder of the Bill & Melinda Gates Foundation; Jimmy D. Wales, founder of Wikipedia; Nicholas Negroponte, founder of the One Laptop per Child (OLPC) non-profit association; Shelly Esque, President of Intel Foundation; John Edward Sexton, President of New York University, and philanthropist Victor Pinchuk, organizer of the event." The Esque surname did not escape me, and it turned out to be Spanish. PLUS, the Padro write-up traces to Coruna: "In Galicia, there is a village named Padron in the province of La Coruna." Is that not astounding, once again finding in the news clues on the very bloodline topic that is in-focus in these updates? The Ales wings are exactly the Portuguese Abreu wings. This could be Shaw-line important, for as the Shaws=Shaves are said to be from Abruzzo, where the region was named after "Abreu" or vice versa, so the Shaws were traced to Ayrshire that was anciently Aleshire! PLUS, the Shaves write-up says: "First found in Aquila capital of Abruzzi Province of Italy. A city on the valley of the Aterno. The citadel (1535) of the Spanish viceroy Don PEDRO de Toledo" (caps mine). Linkage with the Peters surname is evident where the Padros lion design is used by the Swedish Peterson Coat. Proof that Petersons were Peters is where the Scottish Petersons use the lion design in the English Peter Crest, this Coat being the one with the gold scallops on blue...just like the Arms of Coruna!! These scallops are likely traceable to the Spanish Esques. The surname is usually Esquibel-like, but includes an "Esquille," close to "Euskal." BUT, ZOWIE, I had traced the Haskils to "Euskal," and didn't know then where the bell pattern in the Welsh Haskell Coat traced to. Now it's evident as code for the EsquiBEL(LE)S!! Variations of Haskell include "Askill" (i.e. like "Esquille"). Possibly, the nine-apple tree in the Haskel Crest is that of the Ales and Padros. I am more sure now than ever that the Padros=Peters trace to the white-scallop-on-blue Irish Pattersons...quite possibly associated with the Brigantinos of Corunno known to have moved to Ireland. I have seen the rising eagle of the Esquibel surname re-occurringly, but can't recall where. I will notify when I see it again. The lion design of the Swedish Petersons is topped with Zionist stars, signifying a Hebrew/occult family. The same lion, in colors reversed, I easily recall, is used by the French Legro Coat with Gros variation. The French (Normandy) Legros/Grosville Coat uses the Templar cross, same fleur-de-lys style ends as per the Peres surname. The cross in the English Gross Coat seems to apply if the three fingers are identical to those of the lys fingers. The Gross Crest is a "talbot," which was just traced (above) to the mother of Ranulf de Gernon. Plus, we saw the same three-fingered cross on the Grenon Coat. Very apparently, the Gross'/Legros' link to the Gernon>Coruna family, just as expected wherein the Geroie family did descend from the Le Gros surname (see webpage below). I shared earlier that the earliest-known Gross>Geroie family had for a son, Ralph, MalaCorona, but I hadn't checked for Corona links to the Coruna location. I now see that the Spanish Corona Coat uses gold symbols on blue, like Coruna, AND the Corona surname was first found in Galicia, the location of Coruna! The Italian Coronas use the same color scheme. Recalling the "trouve" and "trouveras" motto terms, see the Corona write-up" "First found in Treviso. anciently Tarvisium, a town in Venetia, capital of the province of Treviso. The cathedral of San Pietro is notable and dates back to 1141." I find this all incredible, that it's coming on the same day that I wrote on these topics, but found only afterward when finding that article on the Bill Clinton. By the way, it's the Sawyer Coat that uses "trouveras"...and a talbot in the Crest. It's the English Gerry Coat that uses "trouve." The English Corona Coat is virtually identical with the Italian. "Russia will supply Libya with weapons worth a total of 1.8 billion U.S. dollars, said Prime Minister Vladimir Putin [yesterday]. 'It's not only for small arms and light weapons,' said Putin, adding that the contract was signed on Friday evening. However, the prime minister did not specify which kinds of armament were included in the contract. ...Citing Russian state arms exporter Rosoboronexport, the RIA Novosti news agency reported that Russia had five ongoing military contracts with Libya, including 'military equipment for its ground forces and the navy, the modernization of T-72 tanks and spare parts supplies.'" Small arms or not, 1.8 billion is a lot of bullet-firing equipment. "Georgia has offered to the United States to use its territory for armaments supply route to Afghanistan, President Saakashvili said in an interview with The Associated Press. The proposal, which Saakashvili said was first presented to U.S. Vice President Joe Biden when the latter visited Georgia in July, 2009, offers use of Georgia's Black Sea ports to the Alliance's military supply ships, and its airports for refueling points. ...In March, 2005 Georgia and NATO signed an agreement envisaging use of Georgia's air space, road and rail infrastructure for transit purposes by NATO to send supplies for its troops in Afghanistan. The route operating through Georgia, however, is not sanctioned for arms shipments. "I don't think that Russia can openly object to this,' Saakashvili was quoted as saying in the interview." Putin doesn't want Saakashvili in Georgia, let alone American military. If Obama takes the Georgian offer, Putin might start to seek ways of obliterating the scheme before it's implemented. Hmm. Could "Gernon" and "Cernunnos" ultimately tie back to the Georgians that are central to England's Templar colors? Of course, for the Grenon cross is also the Templar flag of Jerusalem that WAS IN FACT the flag of Templar-era Georgia. See modern flag of Georgia. BEHOLD BEHOLD. Scroll down in the Georgia-flag link, and Georgia's Air Force Ensign. Then compare with the Arms of Gironde!! See also the Arms of East Ayrshire. As the Pattersons appear to link to the Cammells/Campbells, via the camel in the Patterson Crest, see the same "windmill" symbol in the . The Patterson scallops are in the Gironde colors, by the way. Ironically, my email friend with the Patterson surname has been arguing with me back and forth on my Samson theme (she doesn't like, as many others don't, that I make Samson a mythical character). It's ironic because the black lion on gold, with blood drops, is virtually identical to the English Sam/Sammes Coat. And with the evidence that Geroie/Geroy was a surname going back to mythical Geryon, who was defeated by the Hercules Danaan>Danann, it would appear solid that the Samson>Hercules cult is indeed central in the Patterson link to Gero/Gern terms. The last I wrote to her, I said that I regretted adding the Samson cult into my work, but felt long ago that it was necessary. I asked her whether our faith should be troubled if the Samson story is one of many other pseudo-Inspired works still needing removal from Biblical canon. My implication is that our faith should not be shaken at all, anymore than discovering that the Book of Enoch is not Inspired text even though the epistle of Jude quotes from it. We are on the verge of exposing the Samson cult like no one has before. Let's continue, remembering that Mormons trace themselves to it. The "great prophet" of the Mormons was Joseph Smith. Note the "Semper fidelis" motto of the Scottish Smith Coat!! Possibly, "Smith" derived from "Samos." Or, better yet, "Samos" evolved into "smith," a worker in metals. After all, the Samos cult was in SamoThrace, the island where the mythical-Hephaestus metal smith was located...because his Kabeiri-Galli cult was founded there by the proto-Trojans. I stood in the house of Joseph Smith. I went because I was writing an anti-Mormon book. I arrived just as a bus-load of Mormon students from Utah were being escorted through the living room. I piped up and rebuked the speaker, telling her that Joseph Smith had been arrested on divination charges the year (1826) before "finding" the Book of Mormon on golden plates (he did not ever find such plates, of course). The means by which he said he translated the plates into English was nearly identical to how he divined buried treasures: by placing a crystal into a dark hat. He had been taking money from people with the promise of finding buried treasure for them through divination, and he was arrested for this activity.